No, they cannot consume any variety of chocolates like milk, white, dark, baking as well as cocoa powder since it is poisonous to them. Though a tiny morsel of chocolate licked mistakenly should not hurt your cat, still to be on the safe side it is better not to feed it to your cats at all. Chocolate contains theobromine which is extremely dangerous for cats as your feline friends are unable to break them down, unlike humans. Moreover, chocolate is also high in caffeine, sugars as well as artificial colorings, all of which are extremely harmful to your pet resulting in a host of health hazards. Ice cream itself is forbidden for cats since it has milk, sugar and a lot of additives as well as artificial colorings which is harmful to your feline friend. When it comes to flavors like chocolates, it would obviously be an unsafe option for your cats. However, if it licks your finished ice cream bowl, there is not much to panic, though make sure that your kitty does not do it again. Though it contains less toxic components than chocolate, you should still refrain from giving it to your cat as it is high in sugar and fat. Besides chocolate ice cream and milk, other delicacies made from it like syrup, cookies, yogurt, pudding, spread, cake, donuts, muffins, biscuits, and cereal should not be given at all. Dark chocolate is the highest in theobromine than all other varieties and is the most toxic of all. Though white chocolate has a negligible amount of caffeine and theobromine, it is still harmful and hence should be avoided. The amount of chocolate toxic for cats depends on its overall weight and the quantity as well as the variety of chocolate which has been consumed. 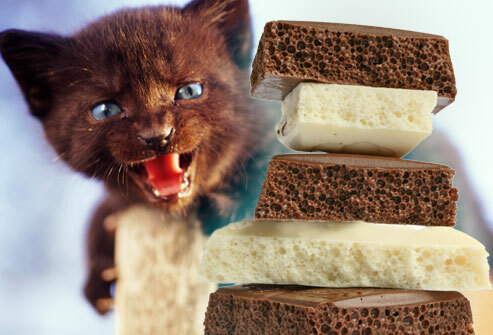 For instance, even small amounts of dark chocolate may be dangerous to your cat, in comparison to the other types. If your cat weighs 10 pounds and has consumed about one and a half tablespoon dry cocoa powder, 20 gram of dark chocolate that is 70 to 85% dark or 25 gram of dark chocolate which is 60 to 69% dark, then contact a veterinarian at the earliest. Moreover, some felines have a higher sensitivity towards theobromine than others and might get affected even after eating a little bit of it. If they eat chocolates in excess or consume ones that are high in theobromine, it might aggravate the symptoms resulting in death. If your cat has licked onto a tiny piece of chocolate and is fine afterward, then there is no cause to panic. However, if he has consumed chocolate in excess and shows a lot of abnormal symptoms, your veterinarian needs to be summoned at once. He might advise you to induce vomiting or try other methods to get the poison out of his body. In case the cat displays severe symptoms, an ECG or other examinations may also be conducted to test its overall health. Published on January 29th 2018 by admin under . Article was last reviewed on 29th January 2018.